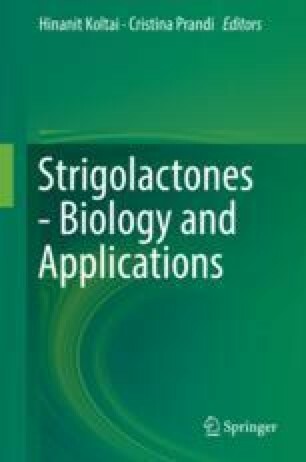 Strigolactones (SLs) are a group of carotenoid derivatives that act as a hormone regulating plant development and response to environmental stimuli. SLs are also released into soil as a signal indicating the presence of a host for symbiotic arbuscular mycorrhizal fungi and root parasitic weeds. In this chapter, we provide an overview on the enormous progress that has been recently made in elucidating SL biosynthesis and signal transduction. We describe the tailoring pathway from the carotenoid precursor to the central intermediate carlactone, highlighting the stereospecificity of the involved enzymes, the all-trans/9-cis-β-carotene isomerase (D27), the 9-cis-specific CAROTENOID CLEAVAGE DIOXYGENASE 7 (CCD7), as well as CCD8 and its unusual catalytic activity. We then outline the oxidation of carlactone by cytochrome P450 enzymes, such as the Arabidopsis MORE AXILLARY GROWTH 1 (MAX1), into different SLs and the role of other enzymes in generating this diversity, and discuss why plants produce many different SLs. This is followed by depicting hormonal and nutritional factors that regulate SL biosynthesis and release, and by a description of transport mechanisms. In the second part of our chapter, we focus on SL perception and signal transduction, describing the SL receptor DECREASED APICAL DOMINANCE 2 (DAD2)/DWARF14 (D14) and its unique features, the central function of protein degradation mediated by the F-box protein MAX2 and its homologs. We also discuss the latest advances in understanding how SLs regulate the transcription of target genes and the role of SMXL/D53 transcription inhibitors. We thank Justine Braguy and Jianing Mi for assisting drawing the illustrations and their critical reading to the manuscript. ATP-binding cassette transporters, consisting of multi-subunits including transmembrane proteins and membrane-associated ATPases, with especially important roles in transport of plant secondary metabolites and hormones. A large, diverse superfamily of hydrolytic enzymes characterized by a core alpha-/beta-sheet, which contains eight beta strands connected by six alpha helices and a catalytic triad. The oxidative cleavage products of carotenoids by CCDs or spontaneous oxidation. A class of symbiotic fungi of the phylum Glomeromycota, characterized by the formation of unique intracellular structures called arbuscules that receive organic carbon from the host and assist the plant in the acquisition of mineral nutrients through their associations with roots. A lactone with a four-carbon heterocyclic ring structure. It is a common moiety in all SLs. A subfamily of SLs characterized by the presence of a tricyclic lactone (ABC-ring) connected to a conserved butenolide ring (D-ring) via an enol ether bridge in R-configuration. A core intermediate in the biosynthesis of SLs, generated by the sequential action of D27, CCD7, and CCD8 from all-trans-β-carotene. A class of terpenoid pigments produced in plants, algae, and some bacteria. They fulfill essential functions in photosynthesis and serve as precursors of hormones and signaling molecules. A large family of non-heme iron (II)-dependent enzymes which break C=C double bonds in carotenoid or apocarotenoid backbone, leading to two carbonyl products. A set of three coordinated amino acids comprising an acid, a base, and a nucleophile (often Asp, His, and Ser, respectively) found in the active site of hydrolases. A component of the SCF-type E3 ubiquitin-protein ligase complexes, which are responsible for substrate recognition, polyubiquitination, and eventually protein degradation. High-performance liquid chromatography, an analytical chemistry technique used to separate, identify, and quantify different compounds in a sample mixture, which relies on pumps to pass a pressurized liquid solvent containing the sample mixture through a column filled with a solid adsorbent material. Due to the slightly different interaction of each substance in the sample with the adsorbent material, different substances have different flow rates when flowing out of the column therefore leading to their separation. Liquid chromatography-mass spectrometry, a commonly used technique in analytical chemistry to identify a chemical by combining liquid chromatography (LC) or high-performance liquid chromatography (HPLC) with the mass analysis capabilities of mass spectrometry (MS). 2-C-Methyl-d-erythritol 4-phosphate pathway, a route for the biosynthesis of the isoprenoid precursor isopentenyl pyrophosphate (IPP), which starts with the condensation of pyruvate with D-glyceraldehyde phosphate. The MEP pathway is responsible for the synthesis of the isoprenoid building block IPP in bacteria and plastids. A pathway for the synthesis of isopentenyl pyrophosphate (IPP) in the cytoplasm of eukaryotic cells, archaea, and some bacteria. The mevalonate pathway is initiated by the condensation of two molecules acetyl-CoA and is the source of IPP in the cytoplasm of eukaryotic cells. Mass spectrometry, an analytical technique that ionizes chemical species by electrons, ions or photons, energetic neutral atoms, or heavy cluster ions and sorts the ions based on their mass-to-charge ratio (m/z) and to detect them qualitatively and quantitatively by their respective m/z and abundance. The region of soil surrounding the roots, which is directly affected by root secretions and is enriched in soil microorganisms. The lower part of the combined grafted plant. The upper part of the combined grafted plant. A class of terpenes formed by the condensation of three isoprene units and consisting of a C15 skeleton. Subfamily of SLs that contain a variable second moiety instead of the tricyclic lactone connected to a conserved butenolide ring (D-ring) via an enol ether bridge in R-configuration.